What can I say about Punta Arenas? It is by far the largest town in southern Patagonia and as such it also serves as a transportation hub. That is exactly what it was to us. We arrived there by plane from Santiago de Chile only to leave a day later for Isla Navarino. Then we came back again for one night and left for Puerto Natales and Torres del Paine National Park. Finally having coming back from Torres, we left for Puerto Montt. Except for our last stay, we were always too busy replenishing our bodies and backpacks with supplies for our next destination, so we did not have much time to explore the town itself, but got very well acquainted with its airport and supermarket. The modern airport has many daily connections to Puerto Montt or Santiago served by Lan Chile and a few to Patagonian destinations served by DAP. When traveling to or from cities farther north, be sure to ask for seats on the side of the plane facing east, so you have a chance of seeing the Patagonian Andes. But if you are as lucky as we were, you will see more clouds than anything else. The airport is quite a bit outside of the sprawling town, but taxi and shuttle fares are very reasonable. There are many bus connections to other towns in the region as well as a port visited by cruise ships. The town is on the shores of the Strait of Magellan - that name alone is sure to attract adventure seeking cruise ship patrons. All three times we paid a visit to Punta Arenas, we stayed at a little 'hosteria' within walking distance of the center. For about $6 per person per night including breakfast, it was a reasonable deal. Since we had a little over a day to kill in Punta Arenas before going to Puerto Montt, we rented a car to explore some points of interest in the vicinity, a penguin colony, and a few attractions south of town, Fuerte Bulnes, Puerto del Hambre, and a geographic center of Chile. 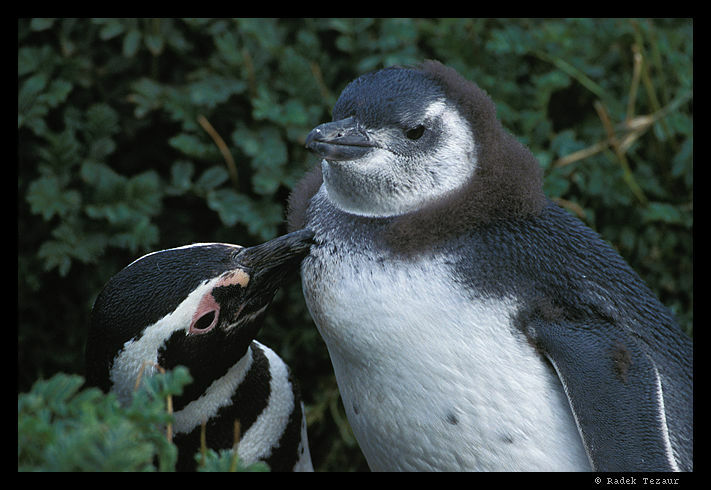 About 65 kilometers by road from Punta Arenas, on the nortwest shores of the Brunswick Peninsula is a colony of Magellanic penguins who come there from October through March to breed. The entire colony is a natural reserve and an entrance fee is collected. You are also restricted to follow a trail so as not to disturb the penguins, who, at the same time, seem quite unconcerned about your presence. The penguins are sure fun to watch, as you can hopefully see from the photos, and it was refreshing to see them outside of a zoo. The Magellanic penguin grow to about two feet, which for me constitutes a real penguin - I was a little disapointed when seeing smallish penguins in South Australia. We spent about two hours before getting thoroughly cold and even then it was hard for me to leave. The drive to the colony is interesting in itself as it goes through an open pampa, where you are likely to spot nandus, and other wildlife. The Chileans seem to think that the Chilean sector of Antarctica really belongs to them. 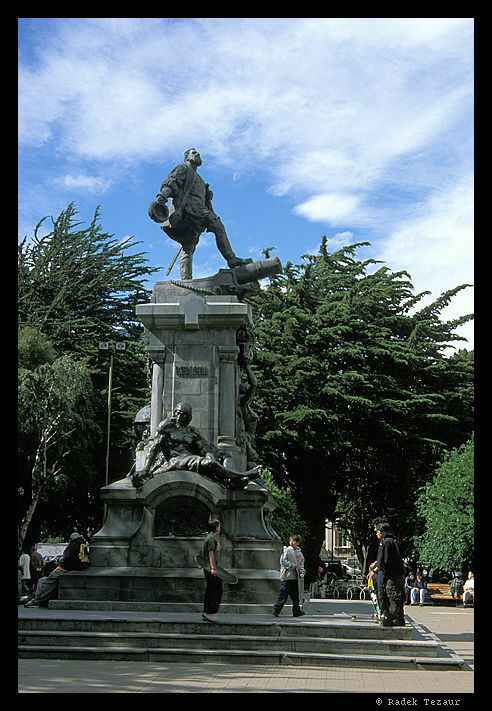 About 40km south of Punta Arenas, there is a monument that marks a geographic center of Chile - it is as far from the Peruvian border as it is from the South Pole. It is already pretty cold in southern Patagonia, how cold must it be on the South Pole. Well, the Chileans will come close to telling you that as their newspapers feature forecasts for the sub-Antarctic islands and the Antarctic coast. 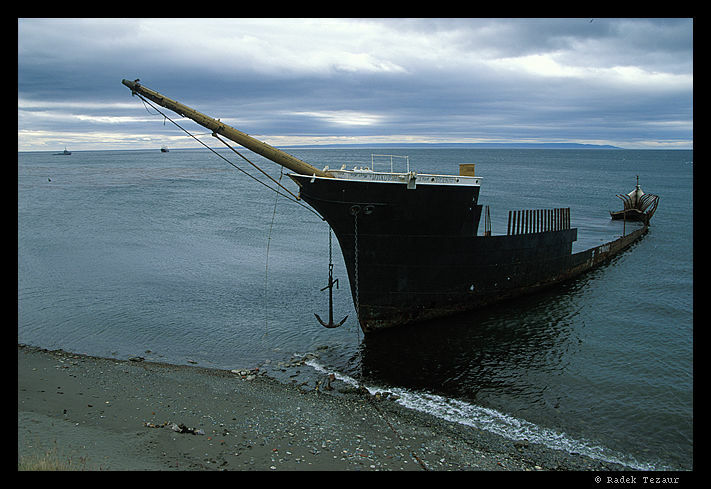 A few kilometers from the 'center of Chile' is Puerto del Hambre, a site of the first European colony in these inhospitable latitudes. As the name indicates, the Spanish colony did not fare well and the settlers starved to death. It was originally founded in 1584 by Pedro Sarmiento de Gamboa as the city of Rey Don Felipe, a name that would seem to assure it of everlasting glory. But it was renamed years later to Port Famine, when the remains of the settlement were discovered by an English corsair. A few hundred years later, Chileans decided to claim the southern Patagonia for themselves, and today's Fuerte Bullnes is a reconstruction of the fort and settlement they established there in 1843.